Are Yellowhammers disappearing from Arran? Yellowhammers used to be familiar birds on Arran throughout the year. During the breeding season the distinctive song of the stunning male, sounding like "a little bit of bread and no cheeeeese", was a feature of many hedgerows throughout the island and in the winter, flocks fed in stubble fields. Examination of the annual bird reports produced by the Arran Natural History Society shows a decline firstly in the breeding records and more recently in the winter groups. Visiting the island regularly throughout the 1960s, 1970s, 1980s and even the 1990s there were areas where you could guarantee to see and hear breeding Yellowhammers. This century there have been no confirmed breeding records. In 2012 and again in 2014 there was one record of one bird singing for a short period of time. During the ten years that I have been bird recorder, the size of wintering groups has never been large. In the winter of 2013-2014 the largest group was fourteen and last winter, 2014-2015, it was twenty-three. This winter to date the largest group has been five and winter records have only been received from two areas. 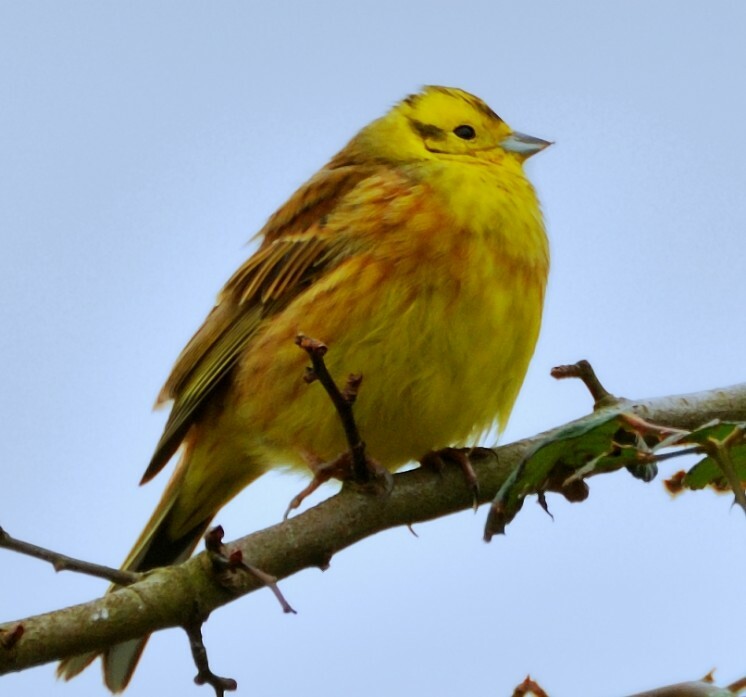 It looks as if Yellowhammer are disappearing from Arran and joining the list of farmland birds that can no longer be seen here, such as the Corn Bunting, last reported in 1984 and Tree Sparrow, last reported in 1997. Data from the British Trust for Ornithology indicates that this is not just a local issue. Yellowhammer abundance began to decline on farmland in the mid 1980s. The species, listed as green in 1996, has been red listed as a Bird of Conservation Concernsince 2002. Reductions in winter seed food availability as a result of agricultural intensification (for example, the loss of winter stubbles and a reduction in weed densities) are widely believed to have contributed to the population decline. Research has identified better population performance in areas with extensive winter stubble, presumably because overwinter survival is relatively high. Research also suggests that the local availability of winter set-aside is a good predictor of sites chosen for breeding territories the next year. Numbers have shown widespread moderate decrease across Europe since 1980. Some projects including one involving the RSPB working with farms in Northern Ireland have had some success but "further research is required to identify possible remedial actions in pastoral areas." In the meantime I would be delighted if you would send me any sightings of Yellowhammer on Arran.